From Hart Corbett comes this photo of Lucius Beebe, taken in 1949 by his father, William C. Corbett. The Corbetts are descendants of one of Carson City’s pioneer families, and although they no longer live in town they still maintain ties to Carson. 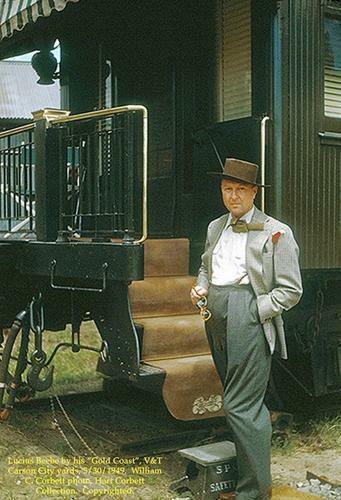 Lucius Beebe here is standing in front of his private rail car, the “Gold Coast”. In 1949 he was living in this car, parked under some cottonwoods in the V&T yards, while writing a book about the Virginia and Truckee Railroad. William and Hart Corbett had come to town Memorial Day weekend to ride a special V&T excursion train from Reno to Minden, and ran into Beebe while stopped at Carson City.